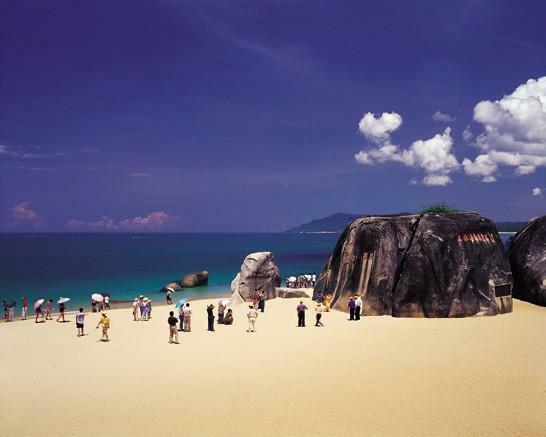 The End of the Earth, named Tianya Haijiao in Chinese, means ‘the Edge of the Sky and the End of the Sea’, this traditional attraction, is located at the foot of Xiama Hill in the town of Tianya, 24 km west of Sanya. 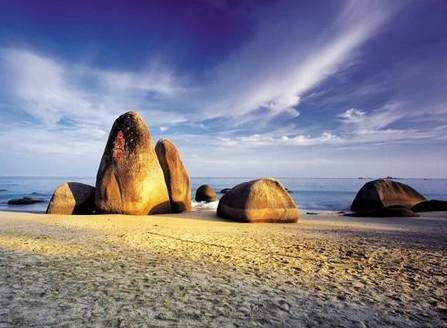 It’s famous for three big rocks-‘Tianya, Haijiao and Column South’. This cape is hugely popular with Chinese tourists who flock here to be photographed in front of the huge rock – ‘Column South’ also features on China’s 2-yuan banknote. This is surely one of the most picturesque sights on the island featuring, bleached white sands, turquoise seas, deep blue skies and verdant hills, it is a must see for anyone searching for a beautiful photo opportunities. There is also a landscaped park and gardens, parking and shopping facilities at the gate and you can also buy various handicrafts, coral and seashells here as well. In ancient China, the Tianyahaijiao was a place especially for exiled criminals during the feudal dynasties, and few of them succeeded in returning to their homes. With so many difficulties and barriers ahead of their lives, the exiles felt when looking out to the sea that they were staring at the edge of the sky and viewing the corner of the sea, as if there were no end to their strife. Roaming in Tianyahaijiao, anyone can see the dreamlike coastal scenery in the fantastic southern atmosphere and soon will be lost in wild and fanciful thoughts: Is there a sea beyond the sea and a sky beyond the sky? 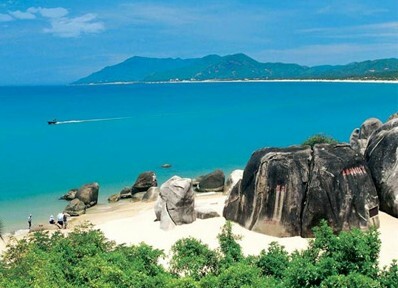 Thus, the name of Tianyahaijiao (the Remotest Cape of the Earth) came into being. The beautiful natural sceneries and stone carvings here are unique and famous in the world. 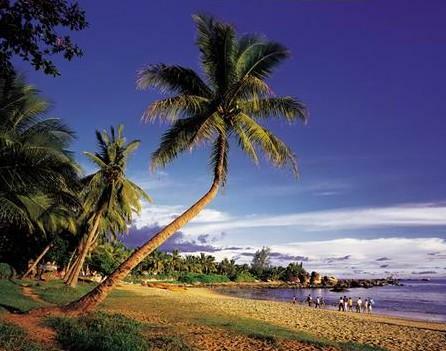 The green water and the blue sky here are of one hue, together with the magical mists, rolling waves, sailing boats, dancing coconut trees, and stone forest form a beautiful poetic picture. There on the beach stands huge rocks on which the Chinese characters of Tianya (the edge of the sky), Haijiao (the corner of the sea), Nantian Yizhu (a pillar stands up in the southern sky), and Haipan Nantian (the sea judges the southern sky) were respectively engraved and have become unique scenic spots in Hainan. The bathing beach, the fishing platform, and the pleasure-boats can provide interesting activities for tourists, and the mountain tour is another attractive route for its Dianho Tai (Torch-lit Tower of the 11th Asian Games), Wanghai Ge (Seaview Pavilion), Huaisu Ting (Pavilion for Memory of Dr. Su Dongpo), and the winding paths up to the mountains. The Tianya Shopping Village, a combination of modern construction and typical, traditional Chinese garden styles, is a very good place for tourists to enjoy food, shop, and go sightseeing. The sunlight rays on the fences here offers green grasses and colourful flowers that make you feel like you’re standing in country fields. The Tianya sunrise and the Haijiao sunset make you feel like you’re standing in a fantasy world of the sun coming up at dawn or going down the rocks at dusk.